A. Harmonic generation: Harmonic generation was the basis for the initial explorations of the THz spectral region and for many applications continues to be the technology of choice. In combination with sensitive detector technology, it provides broad spectral coverage, simple frequency control and measurement, high resolution and sensitivity, and overall system reliability and simplicity. The most important early development was the invention of the cross waveguide harmonic generator with an embedded non-linear diode in the microwave structure. 1 Figure III.A-1 shows a drawing of this device. Since it was designed for spectroscopy, broad spectral coverage was emphasized and only back shorts were included for tuning. Not only are these multipliers broadbanded across an entire waveguide input band, but many harmonics are generated simultaneously. Since linear molecules have series of absorptions in almost, but not exactly, harmonic relation, the multiple harmonic output can be separated and observed by scanning the input frequency of the multiplier through the closely spaced subharmonics of the different absorption frequencies. The resultant closely spaced (in source frequency) absorptions are shown in Fig. III.A-2.2 ,3 (2) Similar devices, some with matching optimized for narrow spectral intervals and operating in chains of low order multiplication, are the sources of choice for many applications requiring local oscillator power for receivers in remote sensing instruments.4 Examples of these instruments will be discussed in more detail in Section V below. Because absorption spectroscopy is linear, increased detector sensitivity can be used to compensate for reduced source power. Thus the introduction5,6 (5) (6)of sensitive cryogenic detectors (9) resulted in a significant advance for THz spectroscopy. The resolution of most THz spectroscopy is limited by Doppler broadening to a Q of about 106. While this is satisfactory for most applications, higher resolution is often important. 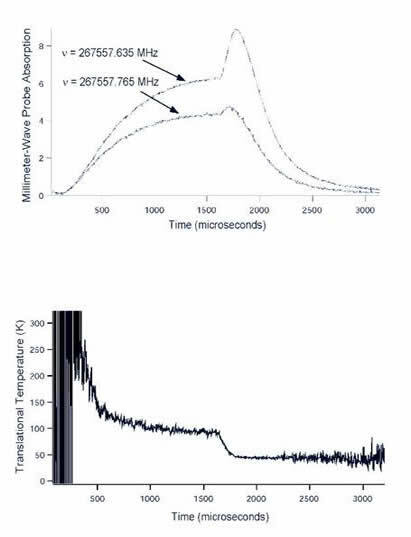 As in many Doppler limited applications, molecular beam approaches have been used in the THz both for molecular beam masers10,11 (10) (11) and for molecular beam electric resonance machines. An especially nice application of the latter used Ramsey's method of separated oscillating fields to obtain a line Q of ~109.12 Figure III.A-4 shows a spectrum obtained with this device. After a demonstration by Woods and his coworkers14 that the positive column of glow discharges contained observable quantities of molecular ions, a number of workers were attracted to the field. The development of the Magnetically Enhanced Negative Glow (MENG) ion source increased concentration s by two orders of magnitude 15 and has been used by a number of workers16-20. (17) (18) (19) Figure III.A-5 shows the cell and Fig. III.A-6 shows the enhancement as a function of applied magnetic field. The low density of the interstellar medium, coupled with energetic fluxes of photons and electrons, leads not only to a relative abundance of molecular ions, also of other reactive species. Figure III.A-9 shows a comparison between pressure broadening and rotationally inelastic cross sections for the 110 - 101 transition of H2S in collision with He. The scientifically interesting result shown here is the divergence between the cross sections at low temperature. This is a direct result of the transition between an essentially classical collision process at high temperature and a distinctly quantum mechanical one at low temperature. Perhaps the most dramatic result in this field has been produced by Willey and his coworkers28 who have show that an ammonia maser can be produced in such a cell as a result of differential rotational relaxation. Figure III.A-10 shows a comparison of the emission at 10 K with the absorption at 35 K. This result is particularly interesting both in that ammonia is observed as a maser in the interstellar medium and that it represents an experimental realization of an early 'thermal' maser concept. Spectroscopy in the THz region can be a powerful probe of molecular systems. In addition to the spectroscopic study of energy levels, the THz has been used to probe both discharge29 and optically pumpedlasers,30,31 (30) as well as chemical reactions in plasmas and collision dynamics in systems far from thermal equilibrium.32 Figure III.A.1-11 shows a recent result which combines many of these experimental technique to establish an experimentally well characterized environment for the study of inelastic collision of molecular ions at very low temperatures. More specifically, this figure shows an example of the results of a THz study of the chemistry and physics which results from a pulsed flux of electrons being focused through a mixture of H2 and CO at ~ 50 K to form HCO+ This experimental system is similar to that shown in Figs. III.A-5 and III.A-6 above, except that the electron flux is produced by an externally gated e-beam source rather than an abnormal glow discharge. The lower trace that shows the measured translational temperature is particularly interesting. Because the ions are formed with high translational temperature, early in the pulse the average over the ions in the cell is dominated by the hotter ions that have just been formed. Later an equilibrium average is reached. When the electron flux ends, the average translational temperature approaches that of the CO and H2. It is satisfying that this latter temperature is in good agreement with the results of standard thermometry applied to the cell walls. upper figure which probe different parts of the Gaussian lineshape. W. C. King and W. Gordy, "One to Two Millimeter Wave Spectroscopy. I.," Phys. Rev., vol. 90, pp. 319-320, 1953. M. Cowan and W. Gordy, "Precision Measurements of Millimeter and Submillimeter Wave Spectra," Phys. Rev., vol. 111, pp. 209-211, 1958. W. Gordy, "Microwave Spectroscopy in the Region of 4-0.4 Millimeters," J. of Pure and Applied Chemistry, Vol. II, pp. 403-434, 1965. H. Rothermel, T. G. Phillips, and J. Keene, "A Solid-State Frequency Source for Radio Astronomy in the 100 to 1000 GHz Range," Int. J. Infr. Millimeter Waves, vol. 10, pp. 83-100, 1989. P. Helminger, F. C. De Lucia, and W. Gordy, "Extension of Microwave Absorption Spectroscopy to 0.37-mm Wavelength," Phys. Rev. Lett., vol. 25, pp. 1397-1399, 1970. P. Helminger, J. K. Messer, and F. C. De Lucia, "Continuously Tunable Coherent Spectroscopy for the 0.1- to 1.0-THz Region," Appl. Phys. Lett., vol. 42, pp. 309-310, 1983. F. J. Low, "Low Temperature Germanium Bolometer," J. Opt. Soc. Am., vol. 51, pp. 1300-1304, 1961. E. H. Putley, "The Ultimate Sensitivity of Sub-mm Detectors," Infrared Physics, vol. 4, pp. 1-8, 1964. E. H. Putley, "Indium Antimonide Submillimeter Photoconductive Detectors," Applied Optics, vol. 4, pp. 649-657, 1990. F. C. De Lucia and W. Gordy, "Molecular Beam Maser for the Shorter-Millimeter-Wave Region: Spectral Constants of HCN and DCN," Phys. Rev., vol. 187, pp. 58-65, 1969. R. M. Garvey and F. C. De Lucia, "Extension of High-Resolution Beam Maser Spectroscopy into the Submillimeter Wave Region," Can J. Phys., vol. 55, pp. 1115-1123, 1977. R. G. Strauch, R. E. Cupp, V. E. Derr, and J. J. Gallagher, "Millimeter Electric Resonance Spectroscopy," Proc. IEEE, vol. 54, pp. 506-513, 1966. G. Winnewisser and G. C. Pelz, The Physics and Chemistry of Interstellar Molecular Clouds. Berlin: Springer-Verlag, 1995. R. C. Woods, T. A. Dixon, R. J. Saykally, and P. G. Szanto, "Laboratory Microwave Spectrum of HCO+," Phys. Rev. Lett., vol. 35, pp. 1269-1272, 1975. F. C. De Lucia, E. Herbst, G. M. Plummer, and G. A. Blake, "The Production of Large Concentrations of Molecular Ions in the Lengthened Negative Glow Region of a Discharge," J. Chem. Phys., vol. 78, pp. 2312-2316, 1983. C. Demuyuck, "Millimeter-Wave Spectroscopy in Electric Discharges. Rare Molecules Show Themselves Only If You Look In The Other Direction," J. Mol. Spectrosc., vol. 168, pp. 215, 1994. H. E. Warner, W. T. Conner, R. H. Petrmichl, and R. C. Woods, "Laboratory Detection of the 110 - 111 Submillimeter Wave Transition of the H2D+ Ion," J. Chem. Phys., vol. 81, pp. 2514, 1984. M. Bogey, C. Demuynck, M. Denis, J. L. Destombes, and B. Lemoine, "Laboratory Measurement of the 110 - 111 Submillimeter Line of H2D+," Astron. and Astrophys., vol. 137, pp. L15, 1984. G. A. Blake, K. B. Laughlin, R. C. Cohen, K. L. Busarow, and R. J. Saykally, "Laboratory Measurement of the Pure Rotational Spectrum of Vibrationally Excited HCO+ (v2 = 1) by Far-Infrared Laser Sideband Spectroscopy," Astrophys. J., vol. 316, pp. L45, 1987. T. Amano and A. Maeda, "Double-Modulation Submillimeter-Wave Spectroscopy of HOC+ in the n2 Excited Vibrational State," J. Mol. Spectrosc., vol. 203, pp. 140-144, 2000. M. C. McCarthy, M. J. Travers, A. Kovacs, C. A. Gottlieb, and P. Thaddeus, "Eight New Carbon Chain Molecules," Ap. J. Supp. Ser., vol. 113, pp. 105-120, 1997. M. C. McCarthy, J.-U. Grabow, M. J. Travers, W. Chen, C. A. Gottlieb, and P. Thaddeus, "Laboratory Detection of the Carbon Chains HC15N and HC17N," Ap. J. Lett., vol. 494, pp. L231-L234, 1998. S. Green and P. Thaddeus, "Rotational Excitation of CO by Collisions with He, H, and H2 under Conditions in Interstellar Clouds," Astrophys. J., vol. 205, pp. 766, 1976. J. K. Messer and F. C. De Lucia, "Measurement of Pressure-Broadening Parameters for the CO-He System at 4 K," Phys. Rev. Lett., vol. 53, pp. 2555-2558, 1984. J. C. Pearson, L. C. Oesterling, E. Herbst, and F. C. De Lucia, "Pressure Broadening of Gas Phase Molecular Ions at Very Low Temperature," Phys. Rev. Lett., vol. 75, pp. 2940-2943, 1995. C. D. Ball and F. C. De Lucia, "Direct Measurement of Rotationally Inelastic Cross Sections at Astrophysical and Quantum Collisional Temperatures," Phys. Rev. Lett., vol. 81, pp. 305-308, 1998. T. M. Goyette and F. C. De Lucia, "Collisional Cooling as an Environment for Planetary Research," J. of Geophys. Research, vol. 96, pp. 17455-17461, 1991. D. R. Willey, R. J. Southwick, K. Ramadas, B. K. Rapela, and W. A. Neff, "Laboratory observation of maser action in NH3 through collisional cooling," Phys. Rev. Lett., vol. 74, pp. 5216-5219, 1995. D. D. Skatrud and F. C. De Lucia, "Dynamics of the HCN Discharge Laser," Appl. Phys. Lett., vol. 46, pp. 631-633, 1985. R. I. McCormick, H. O. Everitt, F. C. De Lucia, and D. D. Skatrud, "Collisional Energy Transfer in Optically Pumped Far-Infrared Lasers," IEEE J. of Quantum Electron., vol. 23, pp. 2069-2077, 1987. H. O. Everitt and F. C. De Lucia, "Rotational Energy Transfer in Small Polyatomic Molecules," Advances in Atomic and Molecular Physics, vol. 35, pp. 331, 1995. L. C. Oesterling, E. Herbst, and F. C. De Lucia, "Millimeter-Wave Time-Resolved Studies of HCO+-H2 Inelastic Collisions," Spectrochim. Acta. A, vol. 57, pp. 705-716, 2001.